My blog has gone rather idle, sorry about that! Ever since I got back from Costume College, I've been utterly swamped. My hands haven't been idle, despite how busy I am. 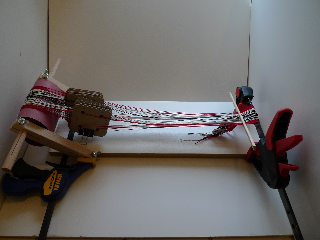 My latest thing has been card weaving, aka tablet weaving, aka inkle weaving (though I think "inkle weaving" really means weaving with an inkle loom, with or without cards, so that might be a bit of a misnomer). This is just a quick post to show Laura (aka Rocking the Frock) my improvised loom (and my equally improvised photo box). of an embroidery scroll frame. Laura is reproducing the gown worn by Eleonora di Toledo as painted by Bronzino. She's considering weaving the gold and silver trim on the gown herself. I'm hoping to help her out by figuring out a way to for her to do it by card weaving. 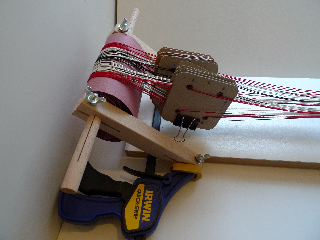 Warps wound around a dowel and cards loaded. 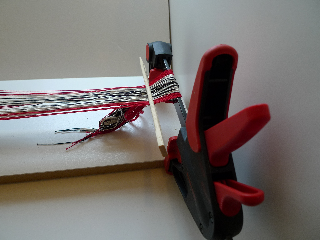 At one end I've got the warps wrapped around one of the two dowels from a scroll frame for embroidery. I clamped the sides of the frame to a scrap of board I had laying around. The pink paper is something like heavy construction paper, somewhat similar in weight to grocery bags. I'm not sure what it is exactly, since it came from a roll a contractor left at my house. The Gem clips are keeping the cards (sixteen, for this pattern) under control while I load them. In-progress warping, not quite ready to weave yet. At the other end I have the warps wrapped around the bar of another clamp. I still need to tighten up the warps before I get started actually weaving. I'm using a pair of not-separated restaurant take-away chop sticks to keep the warps under control in the mean time. By my next post I'll probably have woven this piece. I'll talk more about the process then. Stay tuned!